ROBsessed™ - Addicted to Robert Pattinson: NEW PIC: Robert Pattinson & A Puppy - Need I Say Anymore? 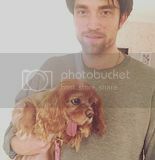 NEW PIC: Robert Pattinson & A Puppy - Need I Say Anymore? Good Time producer Sebastian Bear-McClard shared this adorable pic of Rob and the sweetest pup on his instagram.